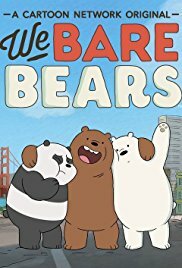 We Bare Bears is a cartoon series about three bears living in San Francisco. The oldest is Grizz who is a Grizzly bear, then there is Panda and Ice Bear who is a polar bear. Grizz is an extrovert, who loves action movies and video games. Panda wants to find a girlfriend and loves anime. Ice Bear loves to cook and is pretty handy with an axe. The three bears try to integrate into human society having grown up alone and homeless. They make a few friends along the way but mostly stick to themselves. It’s a heartwarming cartoon that everyone can watch. The episodes are the brothers trying new restaurants, going to the movies, grocery store and then having something go wrong. I think this show is so cute. I’ve watched three seasons so far. My favourite bear is Ice Bear. He’s the quietest out of the bears and talks in a monotone. Ice Bear says random one liners that I think are funny and endearing. The episodes are about twelve minutes long so it’s good when you want to something short to pass the time. I like to watch it when I’m eating or taking a break. Aww these bears are too cute. I love them!